The early events regulating antiviral CD4 responses were tracked using an adoptive transfer model. CD4+ T cell expansion was nonlinear, with a lengthy lag phase followed by 2 days of explosive proliferation. A small number of naive Ag-specific CD4+ T cells were found in nonlymphoid tissues and, in the 8 days following infection, the number of activated cells increased in all tissues analyzed, and their effector functions matured. Finally, we show that a naive mouse contains ∼100 naive CD4+ precursor cells specific for a single epitope, a precursor frequency of ∼10−5, similar to that of naive CD8+ T cells, indicating that the ∼50-fold difference in size of the two responses to virus infection is determined by something other than the number of precursor cells. The CD4+ T cell plays a cardinal role in regulating the immune response, but our understanding of how CD4+ T cells change in quantity and quality over the course of virus infection remains incomplete. Studies in many model systems have shown that CD8+ T cells outnumber CD4+ cells by ∼50:1 at ∼8–10 days postinfection (1, 2, 3, 4), and several hypotheses have been advanced to explain this difference. These include: different requirements for recurrent Ag contact; different sensitivities to other extrinsic factors such as cytokines or costimulatory molecules; and intrinsic differences in the proliferative potential of the cells. However, the simplest explanation—that CD4+ and CD8+ T cells may differ in the frequency of epitope-specific precursors—has not been rigorously tested. The measurement of precursor frequency is complicated by the difficulty in detecting the extremely low numbers of naive Ag-specific cells that exist in vivo; indeed, functional virus-specific CD4+ T cells remain below detectable levels until ∼5 days postinfection. This numerical constraint has been overcome for CD8+ T cells, allowing the frequency of naive precursor cells to be measured (5) but, to date, estimations of the precursor frequency of naive CD4+ T cells have relied on enrichment for Ag-specific CD4+ T cells (6), raising primary T cell lines against primary Ags (7), or calculations based on the peak numbers of cells, which have led to the suggestion that there are ∼8000 naive cells capable of responding to any one epitope (8). Our knowledge of how CD4+ T cell effector functions are regulated–and, perhaps, change–over the course of infection also lags behind that of CD8+ T cells. As viral load and tissue distribution evolve, there will be shifting demands for CD4 effector activities. It is, therefore, important to determine whether CD4+ T cells become effector cells very early, and simply increase in number thereafter, or if their differentiation continues throughout the expansion phase; an analysis of cytokine production at different times during the expansion phase may illuminate this issue. Another fundamental question concerns the tissue localization of Th cell responses. Most studies of CD4+ T cell responses have focused on lymphoid tissues, and much experimental evidence indicates that dendritic cells bearing foreign Ag migrate to these organs, where they prime naive CD4+ T cells; locally activated CD4 T cells then act on other resident cell types. However, MHC class II+ cells also are present in peripheral tissues. Do antiviral T cells move to these sites after lymphocytic choriomeningitis virus (LCMV)3 infection, and if they do, is this concurrent with the sequence of events in the lymphoid organs? Moreover, CD4 T cells maximize early CD8 responses in some models, and new evidence indicates that CD4+ T cells may be required to maintain the proliferative potential of CD8+ memory T cells. These recent observations raise other interesting questions related to where and when these T cell subsets communicate. Answers to these questions would hint at the cellular and molecular interactions that regulate CD4+ and CD8+ T cell responses. In this study, we use an adoptive transfer model to measure the precursor frequency of naive CD4+ T cells. This approach also has allowed us to evaluate their early proliferation, as well as their functional maturation. We find that CD4 and CD8 T cells have a similar precursor frequency, of ∼10−5. After virus infection, CD4+ T cell proliferation shows a striking lag phase, during which cell division is extremely limited. This is followed by an explosive 2-day multiplication, during which a new cell is generated, on average, every ∼80 ms. Our studies also allow us to evaluate the distribution of naive CD4+ T cells in nonlymphoid tissues, and to document the increases in virus-specific cells that occur in these sites after infection, concurrent with the period of rapid cell division. Finally, we show that, during the first few days of infection, the effector functions of CD4+ T cells undergo functional maturation, as previously reported for their CD8+ counterparts. C57BL/6J mice were purchased from The Scripps Research Institute (TSRI) breeding facility and used when 6–8 wk of age. SMARTA transgenic mice (9) produce CD4+ T cells expressing Vα2 and Vβ8.3 TCR specific for the LCMV epitope gp61–80, and were provided to us by Dr. C. Surh (TSRI, La Jolla, CA). These mice were backcrossed to B6.Ly5a (also provided by Dr. C. Surh) to produce Ly5a+ SMARTA cells. In some cases they were backcrossed to the B6.PL background to produce Thy1.1-positive cells. P14 mice express the TCR for the LCMV gp33 MHC class I epitope (10). Mice were infected by i.p. administration of 2 × 105 PFU of LCMV, Armstrong strain. All experiments involving mice received prior approval from the institutional animal care and use committee. Single-cell preparations of splenocytes were prepared without collagenase pretreatment (which has been reported to improve T cell recovery; Ref.11) and were surface-stained directly ex vivo with combinations of anti-CD4 (clone RM4-5), anti-CD8 (clone 53-6.7), anti-Ly5.1 (Ly5a, clone A20), anti-Ly5.2 (Ly5b, clone 104), anti-CD44 (clone IM7), anti-CD62L (clone MEL-14), anti-Thy1.1 (clone HIS51), and anti-Thy1.2 (clone 53-2.1) (all purchased from eBioscience). Anti-Vα2 TCR (clone B20.1) and anti-Vβ8.3 TCR (clone 1B3.3) were purchased from BD Pharmingen. The intracellular staining (ICCS) assay was performed as described previously (12). Cells were acquired by four-color flow cytometry using BD FACSCalibur at the TSRI core facility and the data was analyzed with FlowJo software (Tree Star). Single-cell suspensions of spleen cells from SMARTA mice were counted, and defined numbers of Vα2+ and Vβ8.3+ donor cells were injected i.v. in a volume of 0.5–0.9 ml. The number of donor cells found in the spleen between 1 and 10 days posttransfer (the “take”) is ∼10% of that transferred into the mice. Therefore, the number of SMARTA cells referred to in the text is 10% of the number injected into the mice. Unless otherwise indicated, mice were infected 1–2 days after cell transfer. This method was adapted from Blattman et al. (5). Individual C57BL/6 mice were given different numbers of gp61–80-specific SMARTA spleen cells i.v. in 0.8 ml of RPMI 1640. The donor cells were either Ly5a or Thy1.1, allowing them to be distinguished from the host cells (Ly5b/Thy1.2). One to 2 days after transfer, the recipient mice were infected with LCMV and 8 days later, the gp61–80-specific CD4+ T cell responses of the host and donor populations were determined by intracellular IFN-γ staining. As described in the text, in one series of experiments the total number of injected cells was equalized by including 2 × 106 C57BL/6 spleen cells along with the different (but much smaller) numbers of SMARTA cells. Lymphocytes were isolated from the spleen and lymph nodes (axillary, inguinal, brachial) using standard procedures. Cell isolation from nonlymphoid tissues was done as described previously (13). In brief, blood was drawn for preparation of PBMC, then the inferior vena cava was severed, and saline was perfused through the right ventricle of the heart using a syringe. The lobes of the lung were removed, diced, digested for 1 h with collagenase, filtered, and centrifuged through a Percoll gradient, from which cells were isolated. The liver was directly perfused with saline through the hepatic artery, mashed across a metal screen, filtered through a cell strainer, and cells were isolated from a Percoll gradient. The small intestine was dissected, and the Peyer’s patches were removed. The remaining material was diced into small pieces and, after vortexing, intraepithelial lymphocytes (IEL) were isolated from a Percoll gradient. One of the difficulties in studying antiviral CD4+ T cell responses is that Ag-specific cells are below detectable levels until ∼5 days postinfection in wild-type mice; it is, therefore, difficult to quantify Ag-specific CD4+ T cell expansion before this time point. In this study, we circumvent this limitation by using an adoptive transfer model, in which TCR-transgenic CD4+ T cells specific for the LCMV MHC class II epitope gp61–80 are injected i.v. into wild-type C57BL/6 recipient mice. The donor cells were obtained from “SMARTA” mice (9) that had been bred to express the Ly5.1 (Ly5a) allele, rendering the transferred CD4+ T cells readily distinguishable from those of the host. Because our main goal, in this study, was to use SMARTA cells as an indicator of CD4+ T cell function and maturation following virus infection, it was important first to ensure that the responses of adoptively transferred SMARTA cells to virus infection were comparable to those of wild-type gp61–80-specific CD4+ T cells. A naive mouse with ∼3 × 103 transferred SMARTA cells was infected with LCMV and, 8 days later, the progeny of these cells constituted the majority of CD4+ T cells in its spleen (Fig. 1⇓A; ∼5–10 × 106 SMARTA cells, 78% of the total CD4+ population), confirming the ability of these transferred cells to rapidly expand in vivo (14). The SMARTA cells were highly activated, as indicated by phenotypic markers (CD44high, CD62Llow, CD43high, and CD122high (Fig. 1⇓B), and IL-7Rαlow (data not shown)); and they responded to peptide contact by making IFN-γ, TNF, and IL-2 (Fig. 1⇓C), similar to wild-type virus-specific CD4+ T cells (3, 15, 16, 17). Furthermore, host cells and SMARTA cells displayed almost identical Ag responsiveness over a 106-fold range of peptide concentration; for both populations, the half-maximal response was achieved at a peptide concentration of ∼5 × 10−8 M (Fig. 1⇓D). Hence, these TCR-transgenic cells resemble the endogenous CD4 response in expansion, activation markers, cytokine expression, and Ag responsiveness. Finally, because CD4+ T cells have been reported, in some circumstances, to suppress CD8+ T cell responses (18), we wished to ensure that the transfer of SMARTA cells had no detrimental effect on the LCMV-specific CD8+ T cell response. This is especially important because CD8+ T cells play a key role in controlling LCMV infection, and any interference in this response might alter virus clearance and, consequently, change Ag load. As shown in Fig. 1⇓E, CD8+ T cell responses at 8 days postinfection were essentially identical in the absence of SMARTA cells, and when 104 SMARTA cells were present at the time of infection. Virus-induced responses of transferred SMARTA cells are comparable to those of wild-type CD4+ T cells. C57BL/6 mice containing 3 × 103 SMARTA cells were infected with LCMV. Detection of transferred cells in naive (uninfected) mice required that the mice received 100-fold more cells. A, Eight days after infection, spleen cells were surface-stained for CD4 and Ly5a. The dot plot shows that the donor cells (enclosed in the oval) constituted ∼78% of all CD4+ T cells (range in several independent experiments was 56–79%). 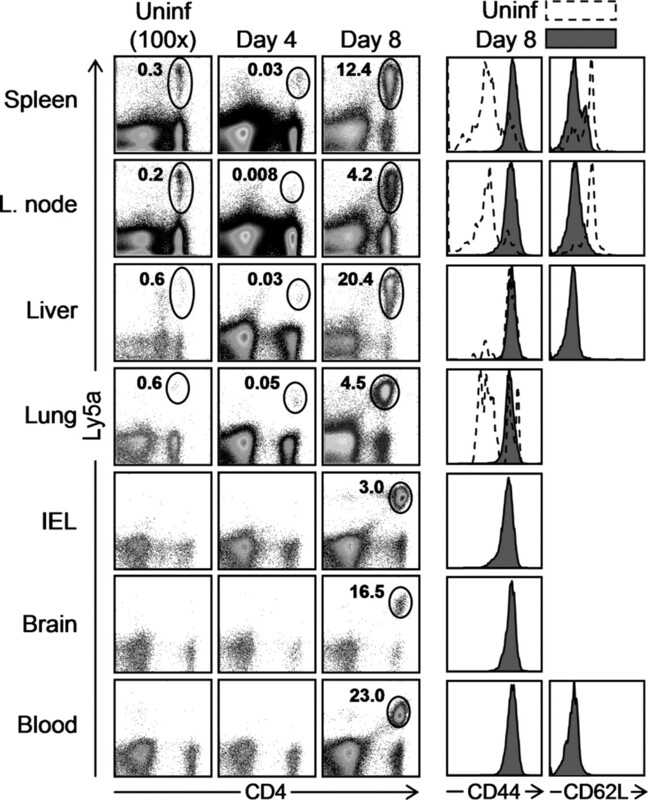 B, Histograms depict the expression pattern of several activation markers on transferred SMARTA cells: naive cells from uninfected mice are shown as dotted lines, and cells from infected mice are shown by shading. C, Spleen cells from infected mice were stimulated with gp61–80 and then stained for intracellular IFN-γ, TNF, and IL-2. Dot plots show CD4+ T cells of host and donor origin (x-axis) vs cytokine expression (y-axes). The numbers indicate the percentage of CD4+ T cells in each quadrant. Data are representative of 40 individual recipient mice analyzed from nine independent experiments. D, The amount of peptide required to induce a half-maximal response of IFN-γ production by host and donor cells was determined across a 106-fold range of gp61–80 concentrations. E, LCMV-specific CD8+ T cell responses (▪) and CD4+ T cell responses (▦) were measured at 8 days postinfection in mice that had the indicated number of SMARTA cells at the time of infection. Next, we wished to determine the proliferation rate of CD4+ T cells. This cannot be accurately estimated by merely enumerating the T cells at various times after virus infection, because cell abundance reflects the balance between cell proliferation and cell death; the proliferation rate is better achieved by measuring dilution of CFSE in the cell membrane. To evaluate CD4+ T cell expansion at the earliest times postinfection, CFSE-labeled SMARTA cells were adoptively transferred. Cell division rapidly dilutes the CFSE signal from progeny cells so, to ensure that the progeny cells in the various generations were sufficiently numerous to be counted, mice with a large number of CFSE+ SMARTA cells (3 × 105 cells) were infected with LCMV, and cell expansion and CFSE content were measured at 2, 4, and 6 days postinfection. As shown in Fig. 2⇓A, this method revealed a pronounced lag phase; almost no cell division occurred during the first 2 days, despite ongoing virus infection. This apparent dormancy was followed by an explosive 2-day period of proliferation, during which the CFSE-labeled cells changed from uniformly CFSEhigh, to uniformly CFSElow, indicative of their having undergone multiple rounds of division; intermediate CFSE levels were observed at 3 days postinfection (data not shown). The dilution of CFSE by 4 days postinfection prevented the direct evaluation of proliferation at later times, but a continued increase in cell numbers (demonstrated below) indicated that proliferation still occurs. Some previous reports on early CD4+ T cell expansion indicate that the cells expand very soon after the introduction of Ag (19), whereas other data show a brief delay in proliferation (20, 21). However, in the above experiment, and the cited studies, large numbers of TCR-transgenic cells were transferred into the host, and it is known that a high frequency of clonotypically identical cells can dramatically modify their capacity to proliferate (22). Thus, we considered it important to determine the range over which the expansion of SMARTA cells might be linearly related to the number initially transferred. Therefore, increasing numbers of SMARTA cells were transferred into C57BL/6 mice which were subsequently infected with LCMV and, 8 days later, SMARTA cells and gp61–80-specific host cells were enumerated. As shown in Fig. 2⇓B, when between 1 and 103 SMARTA cells were present before infection, there was a linear increase in the number present at 8 days postinfection. The total number of gp61-specific cells (host plus SMARTA) was additive over this 1000-fold range of SMARTA cells, implying that the host and SMARTA cells proliferate equivalently, thus providing additional support for using transferred SMARTA cells as an indicator population. However, a plateau effect was observed when a very large number of cells was adoptively transferred; the number of SMARTA cells detected at 8 days postinfection was similar in mice that had contained either 104 or 105 SMARTA cells before infection, consistent with there being an inhibitory effect when a large number of clonotypic cells is present. Therefore, we repeated our evaluation of the early kinetics of CD4+ T cell expansion in response to virus infection, this time using groups of C57BL/6 mice that contained ∼3 × 103 SMARTA cells. These mice were infected with LCMV, and the numbers of SMARTA cells were enumerated at 4, 6, 8, and 12 days postinfection (Fig. 2⇓, C and D). Once again, CD4+ T cell expansion was nonlinear, this time with an even more prolonged lag phase of ∼4 days. This was again followed by a dramatic 2-day burst of proliferation, during which there was a ∼150-fold increase in cell number (approximately seven rounds of cell division), generating ∼2 × 106 progeny cells–on average, a doubling time of 6–7 h during this 2-day period. CD4+ T cell expansion to virus infection is nonlinear. A, C57BL/6 mice with 3 × 105 CFSE-labeled SMARTA cells were infected with LCMV and, at the indicated times postinfection, were sacrificed and analyzed by flow cytometry. The numbers indicate the abundance of CD4+ donor T cells (enclosed in ovals), expressed as a percentage of total isolated lymphocytes, and the CFSE levels of those cells are shown in the histograms beneath each panel. B, To determine the range over which the expansion of SMARTA cells was linearly related to the starting number of SMARTA cells, mice with various numbers of SMARTA cells (shown on x-axis) were infected with LCMV and, 8 days later, the numbers of SMARTA cells (•) and total gp61–80-specific cells (host plus SMARTA, □) were determined. C and D, Mice with 3 × 103 SMARTA cells were infected, and SMARTA cells were enumerated at 4, 6, 8, and 12 days after infection. The numbers represent the absolute number of SMARTA cells per spleen (C), or the percentage of total CD4+ T cells that are of donor origin (D). Previous studies have shown that, under normal circumstances, naive T cells are tightly restricted to lymphoid tissues, and it is in these tissues that they usually first encounter their cognate Ag, which has been captured by APCs in peripheral sites, and carried into draining lymph nodes. Although polyclonal virus-specific CD4+ T cells have been detected in certain peripheral tissues (for example, the lung (23)) late in acute infection, when cell numbers are sufficiently high to permit their detection, the kinetics with which activated virus-specific CD4+ T cells, and their naive precursors, enter many peripheral tissues is uncertain. We have used the adoptive transfer approach to provide a better understanding of the tissue distribution of naive virus-specific T cells, and to determine the abundance of virus-specific CD4+ T cells in various lymphoid and nonlymphoid tissues at early stages of infection. The tissue distribution of naive virus-specific CD4+ T cells was evaluated in mice that had received a large number of SMARTA cells; mice with ∼105 SMARTA cells were maintained for 10–12 days before analysis, in an attempt to ensure that we were detecting cells that had survived the adoptive transfer. All tissues (except blood) were obtained from mice that had been perfused with saline. As shown in Fig. 3⇓, the naive virus-specific SMARTA cells (CD4+Ly5a+) were, as expected, most abundant in the spleen and lymph nodes, and most of these cells were CD44low/CD62Lhigh, as expected. The mice from which these SMARTA cells were derived were not RAG-deficient, and it is known that, even in the absence of LCMV infection, some of the SMARTA cells–and, therefore, some of the transferred LCMV-naive cells–are CD44high, providing an explanation for the small number of CD44high cells in the spleen and lymph nodes. A number of naive cells were detectable in the liver and lung. Surprisingly, most of the SMARTA cells in the liver were CD44high, despite never having encountered their cognate LCMV Ag; cells in the lung were of mixed CD44 phenotype. Very few naive cells were detected in the IEL, or in the blood or brain. The tissue distribution of CD4+ T cells in response to virus infection was determined in recipient mice that contained a lower number of SMARTA cells (103) at the time of infection, because we wished to avoid the plateau effect described in Fig. 2⇑B. Four days after infection, virus-specific cells were barely detected in the spleen, liver, and lung. However, by day 8, SMARTA cells were abundant in all tissues, even within the brain parenchyma, indicative of a broad-ranging immunosurveillance by CD4+ T cells during LCMV infection. The cells were uniformly CD44high, and cells from the spleen, lymph nodes, liver, and blood were CD62Llow (CD62L was not evaluated in cells extracted from lung, IEL, or brain, because the extraction procedure involves proteolytic digestion, which can denude cells of CD62L (24)). Although we cannot distinguish between local cell division, and the ingress of cells that had divided elsewhere, the increased numbers of SMARTA cells observed between days 4–8 in peripheral tissues (Fig. 3⇓) are concurrent with the burst of cell division observed in the spleen (Fig. 2⇑). Virus-specific CD4+ T cells are present in nonlymphoid tissues during acute LCMV infection. SMARTA cells in the indicated tissues were enumerated at 4 or 8 days after infection of C57BL/6 mice that contained 103 SMARTA cells at the time of infection. The analyses of naive SMARTA cells were conducted 10 days after transfer into uninfected mice, and the absence of virus-driven expansion required that 100-fold more cells be transferred (Uninf, ×100). Dot plots identify the SMARTA cells (Ly5a+). The numbers indicate the abundance of CD4+ donor T cells (enclosed in ovals), expressed as a percentage of total isolated lymphocytes, and their expression of CD44 and CD62L is shown by the histograms; shaded histograms depict SMARTA cells from day 8 mice, and the dotted histograms represent SMARTA cells from uninfected mice. The effector functions of CD4+ T cells mature over the course of infection. CD8+ T cell effector functions mature in several ways during acute infection and in the early memory phase (25, 26, 27). To determine whether similar events occur for CD4+ T cells, the cytokine profile, peptide sensitivity, and IFN-γ production of SMARTA cells were measured at various times following virus infection. As previously reported for the CD8 response, there were qualitative and quantitative changes in the cytokine production by CD4+ T cells from days 4 to 12. First, the cells changed in the pattern of cytokines expressed following Ag stimulation (Fig. 4⇓A). At early time points postinfection (days 4 and 6), IFN-γ+/TNF− cells (single positive; top left quadrants) outnumbered IFN-γ+/TNF+ cells (double positive; top right quadrants) by ∼2.5:1, but by day 8 the ratio had reversed, to ∼1:2.5 and, by 12 days postinfection, almost 90% of the cells were double positive. This change is very similar to that observed in CD8+ T cells during LCMV (27) or influenza virus (28) infections. In addition, the level of IFN-γ produced by the responding cells changed markedly over this time period, increasing in a near-linear manner, and more than doubling between days 4 and 12 (Fig. 4⇓B). The cells also increased their ability to respond to low doses of peptide—that is, in their functional avidity. When the ability of the cells to express maximal levels of IFN-γ was determined over a 106-fold range of peptide concentration, day 8 cells required ∼6-fold less peptide than did day 4 cells (Fig. 4⇓C); an almost identical increase in functional avidity occurs between days 4 and 8 postinfection in P14 transgenic CD8+ T cells (26). Together, the data indicate that CD4+ T cells, like CD8+ T cells, mature functionally from days 4 to 8. Finally, we determined the proportion of SMARTA cells that were capable of making cytokine in response to Ag stimulation; this calculation was facilitated by our ability to readily identify all of the transferred Ag-specific T cells by surface staining. For comparative purposes, we conducted the same experiment using P14 mice, which bear the receptor for the LCMV gp33 epitope (10). SMARTA and/or P14 cells were adoptively transferred into wild-type mice, which were infected with LCMV and, 8 days later, the abundances of the two T cell populations were measured by ICCS (Fig. 4⇓D). Based on 24 independent measurements of P14 responses, and 19 of SMARTA responses, the proportion of CD4+ T cells that respond to Ag contact by producing IFN-γ (∼61%) is significantly lower than the proportion of CD8+ T cells that respond (∼90%; p < 0.001). This result also suggests that, if IFN-γ expression was the sole criterion for enumerating virus-specific CD4+ T cells, prior measurements of their numbers may have underestimated their frequency. Effector functions of CD4+ T cells mature over the course of infection. A, C57BL/6 mice with 3 × 103 SMARTA cells were infected with LCMV, and, at the indicated times postinfection, the ability of the SMARTA cells to make IFN-γ and TNF in response to in vitro peptide stimulation was determined by ICCS. The plots are gated on Ly5a+ CD4+ T cells (i.e., only SMARTA cells are shown). Cells were incubated without (left column) or with (right column) gp61–80 peptide. The numbers indicate the proportion of cells in that quadrant, as a percentage of total SMARTA cells. B, The geometric mean fluorescence intensity (gMFI) of IFN-γ made by SMARTA cells at the indicated times after infection are shown. C, The relative amounts of IFN-γ produced by SMARTA cells (gMFI) at days 4 and 8 in response to a 106-fold range of gp61–80 concentrations (x-axis) were measured. For each of the two time points, the maximum response was assigned the value 100%, and the responses at lower peptide concentrations were plotted as a fraction of the maximum (y-axis). The dotted lines indicate the peptide concentrations required to drive a half-maximal response. D, P14 cells (CD8+ T cells carrying a transgenic receptor for the LCMV MHC class I epitope gp33) and SMARTA cells were adoptively transferred into different C57BL/6 mice, and, 8 days after LCMV infection, the proportion of each population that made IFN-γ in response to cognate peptide stimulation was determined by ICCS. The p value was calculated using the Student t test. The frequency of naive splenic CD8+ T cells specific for a single viral MHC class I epitope has been identified by the adoptive transfer of various numbers of TCR transgenic CD8+ T cells specific for a known viral epitope, and is estimated at ∼10−5 (5). However, the precursor frequency for CD4+ T cells has not been previously determined. To address this issue, differing numbers of SMARTA cells were transferred into recipient mice, and the relative proportions of SMARTA cells to gp61–80-specific host cells were determined by ICCS at 8 days postinfection. SMARTA cells could be enumerated using Thy1.1 and CD4 costaining, but to identify gp61–80-specific host cells, it was necessary to use ICCS. As shown in Fig. 5⇓A, using IFN-γ-producing cells as the criterion, mice with ∼104 SMARTA cells at the time of infection mounted gp61–80-specific responses that were almost entirely composed of donor cells, while the responses in mice with only a few (∼1) SMARTA cells were reliant on host CD4+ T cells. The host and SMARTA responses were almost equivalent in mice with ∼100 SMARTA cells, providing a first approximation of the precursor frequency of gp61–80 T cells in a naive C57BL/6 mouse. More detailed data are presented in Fig. 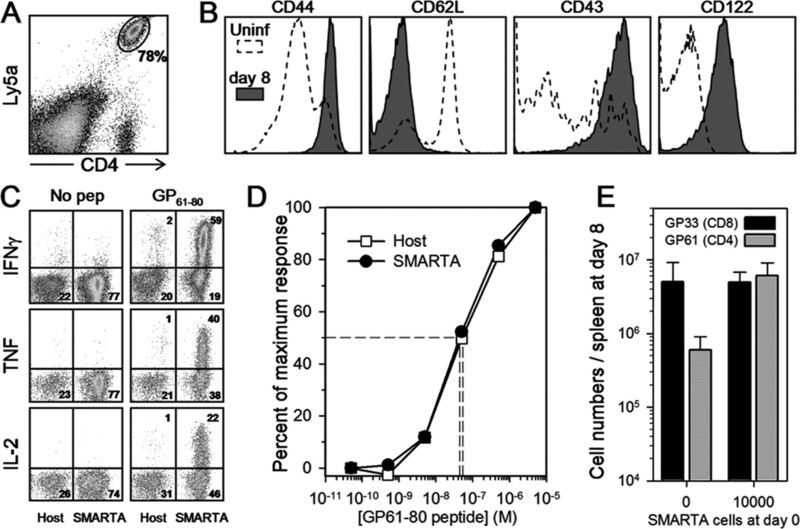 5⇓B, in which a 105-fold range of SMARTA cells was used; these experiments suggest that a naive mouse contains ∼60 gp61–80-specific CD4+ T cells. One factor complicating interpretation of these data is that the take of the donor cells could vary over the very wide range of cell numbers transferred, and any variation in the take could skew the estimates of precursor frequency. For example, if recipient mice can accommodate only a limited number of transferred donor cells, then the relationship between the number of cells transferred, and the number of cells retained by the recipient, may be nonlinear. To overcome this problem, a second approach was taken, in which different numbers of SMARTA cells were mixed with an excess (2 × 106) of C57BL/6 “filler” spleen cells; thus, recipient mice all received almost identical numbers of adoptively transferred cells, but with differing content of SMARTA cells. The data derived from one such experiment (two mice per group) are shown in Fig. 5⇓C, and indicate a naive gp61–80-specific cell number of ∼150 per mouse spleen. Taken together, the data suggest that the number of LCMV-naive gp61–80-specific T cells is ∼100, similar in magnitude to that reported for naive gp33–41-specific CD8 T cells (5). Thus, the ∼10- to 50-fold difference in abundance of CD4+ and CD8+ T cells that is present during the anti-LCMV response (29, 30) is unlikely to be attributable to a difference in frequency of LCMV-naive precursors. The precursor frequency of CD4+ T cells specific for a single viral epitope is ∼10−5. The indicated numbers of SMARTA cells were transferred into C57BL/6 mice that were infected 1–2 days later. Eight days after infection, the fraction of the gp61–80 response represented by donor and host CD4+ T cells was determined by ICCS for IFN-γ. A, Examples of responses in mice given 1, 102, or 104 SMARTA cells (Thy1.1+). B, The percentage of the gp61–80 response due to host or donor cells was determined across a large range of SMARTA cell numbers. Each data point represents average ± SE from two to four mice pooled from two independent experiments. The dotted line indicates the point at which SMARTA and host cell responses were numerically equal. C, Pairs of mice were given different numbers of SMARTA cells along with 2 × 106 C57BL/6 splenocytes as filler cells. The fraction of the response at day 8 made by host or donor cells is shown, along with a Hill four-parameter curve fit. Each symbol represents the average ± SE of two mice, and the data are representative of two independent experiments. Of the many factors that may influence the overall size of the adaptive T cell response, perhaps the most obvious is the frequency of naive precursor cells capable of responding to any given MHC/peptide complex. In theory, as many as 1015 different αβ TCRs could be generated through somatic recombination (31). This number far exceeds the total number of naive T cells in a mouse spleen (∼2 × 107) and it is, at first blush, surprising that so much potential diversity may be absent from individual animals. However, TCR triggering is relatively flexible, broadening the effective repertoire far beyond its apparent numerical constraint: for both CD8+ T cells and CD4+ T cells, many different TCRs can respond to a single viral epitope (32, 33); and a single TCR sequence may be able to interact with a variety of rather dissimilar MHC/peptide complexes (34). The TCR sequence diversity of naive murine T cells has been directly evaluated, leading to the conclusion that a mouse spleen contains ∼2 × 106 distinct clones, of ∼10 cells each (35), and a functional analysis suggested that a mouse harbors ∼100 naive CD8+ T cells capable of responding to a single epitope (5). Herein, we provide the first measurement of the precursor frequency of CD4+ T cells; our functional analyses indicate that a mouse spleen contains ∼100 naive CD4+ T cells able to respond to a given epitope, almost 100-fold lower than recently estimated (8). When no SMARTA cells were present, these 100 host cells gave rise to ∼5–9 × 105 progeny cells by 8 days postinfection (Fig. 1⇑E and Fig. 2⇑B). 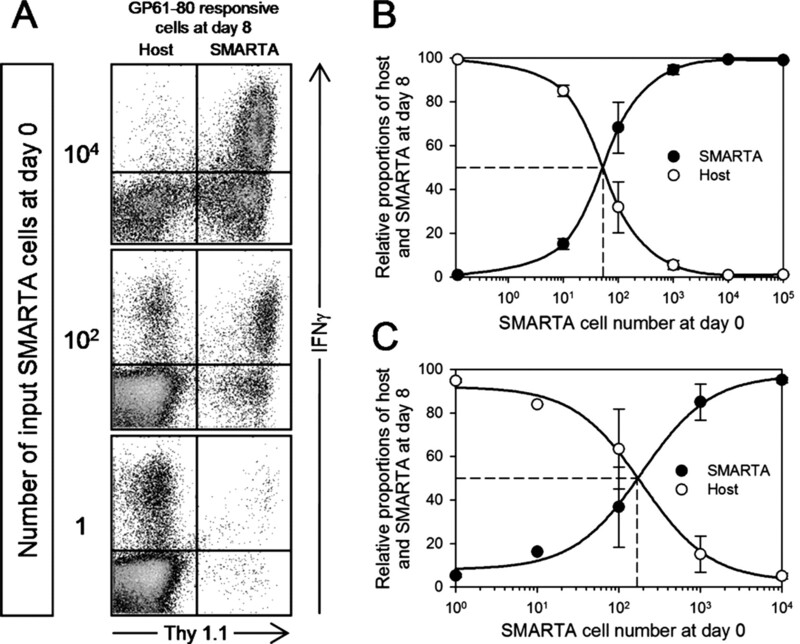 This degree of precursor cell expansion appears to be maintained when between 1 and 1000 SMARTA cells were present, because the total number of gp61–80-specific cells over this range always approximated the sum of (SMARTA cells + ∼7 × 105); this constitutes further evidence that the host precursor frequency is ∼100 cells. Thus, the precursor frequency of CD8+ and CD4+ T cells are similar in mice. Interestingly, theoretical calculations and PCR-based analyses have suggested that human T cell responses also may rely on ∼100 clones for each epitope (36), indicating that this baseline capacity for mounting epitope-specific responses may represent a general rule of adaptive immunity. However, our conclusion has some caveats. First, it is possible that we have underestimated the number of naive gp61–80-reactive cells, because some wild-type TCRs may have weaker affinity than the SMARTA TCR for the I-Ab + gp61–80 complex, and such cells may not expand as vigorously as SMARTA cells. Second, a recent report indicated that LCMV-specific CD4+ T cells can kill target cells in vivo (37), raising the possibility that the transferred SMARTA cells might have directly reduced the viral load. However, CD4+ T cell-mediated in vivo killing appears to be relatively inefficient, because the half-life of peptide-coated target cells was ∼20 h (37); this compares unfavorably with the in vivo cytolytic effects of CD8+ T cells, for which the half-life of epitope-expressing target cells is 1–4 h (12, 38, 39). Consistent with this, we found no detectable CD4-dependent in vivo cytotoxicity of gp61–80-coated target cells using a 1 h in vivo assay, during which 90–100% of target cells coated with LCMV CD8 epitope peptides (gp33 or nucleoprotein (NP)396) were lysed (data not shown). Moreover, CD4+ T cells alone are incapable of resolving the infection: CD8-deficient mice given SMARTA cells were unable to control LCMV infection (data not shown). Finally, SMARTA cell transfer did not negatively affect the virus-specific CD8+ T cell response, which is central to LCMV control and eradication (Fig. 1⇑E). Next, we evaluated the early events in CD4+ T cell expansion. Ag-driven proliferation and differentiation is responsible for most of the increase in T cell numbers, and the roles of Ag quantity and longevity in dictating the magnitude and quality of the primary and memory responses are areas of active investigation in several laboratories. For CD8+ T cells, even an abbreviated period of Ag stimulation leads to a primary response that is relatively normal in size, suggesting that CD8+ T cell expansion may be preprogrammed (40, 41, 42). Some evidence indicates that the same is true for CD4 T cells, because shortening the infectious period has no deleterious effect on the magnitude of the response (43, 44); however, other data indicate that CD4+ T cell responses are reduced in situations of low/brief Ag stimulation (42, 45). In Fig. 2⇑, we show that the kinetics of the antiviral CD4+ T cell response is nonlinear, and has two key features: an initial lengthy lag phase, followed by an explosive 2-day proliferation. The lag phase, which extends for 4 days following LCMV infection (Fig. 2⇑C), cannot be ascribed to the absence of LCMV-naive SMARTA cells from the spleen or lymph nodes (Fig. 3⇑). Using two-photon microscopy (46), others have shown that naive T cells form transient, then stable, interactions with Ag-presenting dendritic cells during the first ∼24 h following Ag delivery, and only then do they begin to proliferate (a simulation of the early events in T cell responses is proposed in Ref.8). Thus, it is possible that, during the first 2 days of infection, Ag presentation is a limiting factor, preventing extensive CD4+ T cell expansion; however, very high titers of LCMV (∼106 PFU/g) are present by 2 days following infection (47). Indeed, LCMV titers in the spleen peak at 3 days postinfection, and descend rapidly from days 3 to 6 (47), during which time CD4+ T cell expansion is maximal. Thus, it is possible that there may be active, Ag-independent regulation of CD4+ T cell expansion. For example, the delayed initiation of proliferation could reflect a dependence of CD4+ T cell responses on accessory molecules (29), which either stabilize the immunological synapse (48) or directly signal into the cells. Alternatively, the constraint on expansion may result from active inhibition, perhaps mediated by local inflammation; when this subsides, proliferation can begin. Once proliferation commences, it proceeds quickly, and appears to be uninterrupted, because all cells become CFSElow during a 2-day period. Previous estimates of CD4+ T cell proliferation assumed that it was continuous from the time of infection, and concluded that the doubling time of CD4+ T cells must be ∼11 h, substantially slower than that of CD8+ T cells (49); however, our demonstration that the cells undergo an ∼150-fold expansion in 2 days indicates that CD4+ T cells must divide every 6–7 h during this period. An elegant comparison of CD4+ T cell responses with CD8+ T cell responses led to the conclusion that CD4+ T cells are programmed to undergo limited proliferation, and that many are arrested after very few divisions (21). We could not identify any such proliferative CD4+ T cell arrest in this study. There are several possible reasons for this discrepancy; for example, different models of infection were used. It also may be significant that, in the published study, large numbers (2 × 106) of TCR-transgenic cells were transferred; others have shown that, when a high number of clonotypic cells is present, their ability to proliferate is limited (22), and we demonstrate herein a plateau effect when >104 cells are present at the time of infection (Fig. 2⇑B). This in vivo restriction on CD4+ T cell proliferation may reflect a physiological control mechanism which sets the upper limit of clonotypic T cell expansion, a phenomenon that also affects CD8+ T cells (50, 51). Several studies have followed CD4+ T cell trafficking to peripheral sites after infection (20, 23, 52, 53, 54). Influenza, Sendai, and respiratory syncytial virus infections recruit virus-specific CD4+ T cells into the lung and, after influenza infection, virus-specific CD4+ T cells in peripheral and lymphoid tissues express a variety of cytokines (20). In this study, the ability of LCMV-specific CD4+ T cells to traffic to several nonlymphoid tissues was examined (Fig. 3⇑). Ten days after transfer, surviving LCMV-naive CD4+ T cells were present in the liver and lung. This contrasts with transferred LCMV-naive CD8+ cells, which showed very little trafficking into the lung or liver (55); however, in those studies, the transferred cells were analyzed 4 h after injection, suggesting the possibility that LCMV-naive T cells may, over a period of days, enter peripheral nonlymphoid tissues. The marker phenotype of LCMV-naive CD4+ T cells was evaluated, and naive cells in the spleen and lymph nodes were CD44low, as expected; surprisingly, the naive SMARTA cells in the liver of the same animals were uniformly CD44high, despite never having been exposed to LCMV Ag. Because the transferred SMARTA cells were obtained from an otherwise immunocompetent donor, it is possible that some of the cells carried an alternate TCR, allowing them to be activated by an undetermined Ag, and causing them to become CD44high; thus, it is possible that the accumulation in the liver may be specific for some Ag other than LCMV. Furthermore, others have recently shown that, during a virus infection, previously primed CD4+ T cells (but not naive cells) can be recruited to a peripheral tissue (lung) in a non-Ag-specific manner (56). However, we propose that the SMARTA cells in the liver may be physiologically distinct from those in other tissues, leading to their being selectively retained in that organ, as has been reported for activated T cells (57). It may be relevant that, in naive “Yeti” mice, which express yellow fluorescent protein under the control of the IFN-γ promoter, 30–90% of T cells in the liver are fluorescent, while T cells in lymphoid tissues are not (58). The liver has been proposed as a “graveyard” for T cells (59); perhaps the presence of these particular CD44high LCMV-naive SMARTA (and Yeti) cells in the liver reflects a physiological status that condemns them to imminent execution. After infection, there was a striking increase in the percentage of SMARTA cells in the peripheral tissues. The percentages of SMARTA cells in the lung and IEL escalated concurrently with the onset of rapid proliferation in the spleen and, at 8 days postinfection, SMARTA cells were highly abundant in the liver, which has also been reported for CD8+ T cells after infection (24, 60, 61, 62). Nearly all of the SMARTA cells found in these organs after infection were activated, as indicated by elevated CD44 and reduced CD62L expression, consistent with what has been seen for CD4+ T cells after Sendai virus infection, and CD8+ T cells after Sendai, vesicular stomatitis virus, Rotavirus, and Listeria infections (23, 63, 64). Interestingly, activated SMARTA cells were particularly abundant in the intestinal epithelium after infection; the virus-specific population represents a major fraction of the IEL, implying directed (perhaps, Ag-dependent) accumulation at this site. An earlier analysis identified LCMV-specific CD8+ T cells among IEL, but failed to detect viral Ag (65); however, Ag was sought by immunohistochemistry, which may not have been a sufficiently sensitive approach. CD4+ T cell migration to the lung has been reported after influenza infection (20), and activated CD4+ T cells can be found in lung, liver, and intestinal lamina propria in addition to lymphoid tissues following Listeria infection (66). Furthermore, autoreactive CD4+ T cells travel to the CNS in models of experimental allergic encephalomyelitis (67). These data, from a number of different animal models, indicate that CD4+ T cells carry out widespread immunosurveillance, like their CD8+ counterparts. We have not yet determined whether the LCMV-specific CD4+ T cells in the peripheral tissues divide in situ, or if cell division occurs elsewhere else. It also will be interesting to determine whether CD4+ memory T cells persist at these sites. Finally, we show that CD4+ T cells improve functionally early in the antiviral response (Fig. 4⇑). Like CD8 T cells, they acquire a double-positive phenotype for IFN-γ and TNF, and their sensitivity to peptide is increased; recent evidence indicates that the CD4 molecule increases the association of Lck with the immunological synapse, thus increasing sensitivity to Ag (68). However, despite this increased sensitivity, the concentration of peptide required to trigger IFN-γ production is greater for CD4+ T cells than for CD8+ T cells, consistent with a previous analysis (69); at day 8, the half-maximal response for gp61–80-specific CD4+ T cells is ∼20 nM, ∼10- to 100-fold greater than that reported for LCMV-specific CD8+ T cells (26). These changes improve the ability of these cells to respond to trace amounts of Ag. Interestingly, these events occur concurrent with the period of greatest expansion, suggesting a link between cell division and differentiation. A major conclusion from these studies is that virus-specific CD4+ T cells and CD8+ T cells share similar precursor frequencies of ∼100 cells that are able to respond to a given epitope, and this number may be common to mice and humans. The effector functions of both cell types mature over the days following virus infection, and both populations rapidly migrate to nonlymphoid tissues, where they can exert their physiological responses to infection. However, they differ both in the kinetics of expansion, and in their ultimate abundance. Our data show that the CD4+ T cell expansion phase itself has three phases: an early delay in the presence of Ag, followed by a fast expansion that leads up to a plateau that is markedly lower than the “set point” for CD8+ T cells. The identification of these separate stages, and the factors that determine the set points for these two T cell populations, beg further characterization at the molecular level. Ongoing studies are focused on dissecting the interactions, both positive and negative, between these two populations, and on better understanding the factors that regulate their expansion, contraction, and passage into the memory phase. We are grateful to Annette Lord for excellent secretarial support. This is manuscript number 17495-NP from The Scripps Research Institute. ↵1 This work was supported by National Institutes of Health Grant AI-52351. ↵3 Abbreviations used in this paper: LCMV, lymphocytic choriomeningitis virus; ICCS, intracellular staining; IEL, intraepithelial lymphocyte. Kamperschroer, C., D. G. Quinn. 1999. Quantification of epitope-specific MHC class-II-restricted T cells following lymphocytic choriomeningitis virus infection. Cell. Immunol. 193: 134-146. Harrington, L. E., R. G. van der Most, J. L. Whitton, R. Ahmed. 2002. Recombinant vaccinia virus induced T cell immunity: quantitation of the response to the virus vector and the foreign epitope. J. Virol. 76: 3329-3337. Varga, S. M., R. M. Welsh. 1998. Detection of a high frequency of virus-specific CD4+ T cells during acute infection with lymphocytic choriomeningitis virus. J. Immunol. 161: 3215-3218. Maini, M. K., N. Gudgeon, L. R. Wedderburn, A. B. Rickinson, P. C. Beverley. 2000. Clonal expansions in acute EBV infection are detectable in the CD8 and not the CD4 subset and persist with a variable CD45 phenotype. J. Immunol. 165: 5729-5737. Lemaitre, F., M. Viguier, M. S. Cho, J. M. Fourneau, B. Maillere, P. Kourilsky, P. M. van Endert, L. Ferradini. 2004. Detection of low-frequency human antigen-specific CD4+ T cells using MHC class II multimer bead sorting and immunoscope analysis. Eur. J. Immunol. 34: 2941-2949. Li Pira, G., L. Oppezzi, M. Seri, M. Westby, F. Caroli, D. Fenoglio, F. Lancia, A. Ferraris, L. Bottone, M. T. Valle, et al 1998. Repertoire breadth of human CD4+ T cells specific for HIV gp120 and p66 (primary antigens) or for PPD and tetanus toxoid (secondary antigens). Hum. Immunol. 59: 137-148. Catron, D. M., A. A. Itano, K. A. Pape, D. L. Mueller, M. K. Jenkins. 2004. Visualizing the first 50 hr of the primary immune response to a soluble antigen. Immunity 21: 341-347. Oxenius, A., M. F. Bachmann, R. M. Zinkernagel, H. Hengartner. 1998. Virus-specific MHC-class II-restricted TCR-transgenic mice: effects on humoral and cellular immune responses after viral infection. Eur. J. Immunol. 28: 390-400. Pircher, H., D. Moskophidis, U. Rohrer, K. Burki, H. Hengartner, R. M. Zinkernagel. 1990. Viral escape by selection of cytotoxic T cell-resistant virus variants in-vivo. Nature 346: 629-633. Maxwell, J. R., R. J. Rossi, S. J. McSorley, A. T. Vella. 2004. T cell clonal conditioning: a phase occurring early after antigen presentation but before clonal expansion is impacted by Toll-like receptor stimulation. J. Immunol. 172: 248-259. Whitmire, J. K., J. T. Tan, J. L. Whitton. 2005. Interferon-γ acts directly on CD8+ T cells to increase their abundance during virus infection. J. Exp. Med. 201: 1053-1059. Brooks, D. G., L. Teyton, M. B. Oldstone, D. B. McGavern. 2005. Intrinsic functional dysregulation of CD4 T cells occurs rapidly following persistent viral infection. J. Virol. 79: 10514-10527. Whitmire, J. K., M. S. Asano, K. Murali-Krishna, M. Suresh, R. Ahmed. 1998. Long-term CD4 Th1 and Th2 memory following acute lymphocytic choriomeningitis virus infection. J. Virol. 72: 8281-8288. Crotty, S., E. N. Kersh, J. Cannons, P. L. Schwartzberg, R. Ahmed. 2003. SAP is required for generating long-term humoral immunity. Nature 421: 282-287. Varga, S. M., R. M. Welsh. 2000. High frequency of virus-specific interleukin-2-producing CD4+ T cells and Th1 dominance during lymphocytic choriomeningitis virus infection. J. Virol. 74: 4429-4432. Zhong, W., D. Marshall, C. Coleclough, D. L. Woodland. 2000. CD4+ T cell priming accelerates the clearance of Sendai virus in mice, but has a negative effect on CD8+ T cell memory. J. Immunol. 164: 3274-3282. Cauley, L. S., T. Cookenham, T. B. Miller, P. S. Adams, K. M. Vignali, D. A. Vignali, D. L. Woodland. 2002. Cutting edge: virus-specific CD4+ memory T cells in nonlymphoid tissues express a highly activated phenotype. J. Immunol. 169: 6655-6658. Unsoeld, H., H. Pircher. 2005. Complex memory T-cell phenotypes revealed by coexpression of CD62L and CCR7. J. Virol. 79: 4510-4513. Liu, F., J. L. Whitton, M. K. Slifka. 2004. The rapidity with which virus-specific CD8+ T cells initiate IFNγ synthesis increases markedly over the course of infection, and correlates with immunodominance. J. Immunol. 173: 456-462. Slifka, M. K., J. L. Whitton. 2000. Activated and memory CD8+ T cells can be distinguished by their cytokine profiles and phenotypic markers. J. Immunol. 164: 208-216. Belz, G. T., W. Xie, P. C. Doherty. 2001. Diversity of epitope and cytokine profiles for primary and secondary influenza a virus-specific CD8+ T cell responses. J. Immunol. 166: 4627-4633. Whitmire, J. K., K. Murali-Krishna, J. D. Altman, R. Ahmed. 2000. Antiviral CD4 and CD8 T-cell memory: differences in the size of the response and activation requirements. Philos. Trans. R. Soc. Lond. B. Biol. Sci. 355: 373-379. Pewe, L. L., J. M. Netland, S. B. Heard, S. Perlman. 2004. Very diverse CD8 T cell clonotypic responses after virus infections. J. Immunol. 172: 3151-3156. Cameron, T. O., G. B. Cohen, S. A. Islam, L. J. Stern. 2002. Examination of the highly diverse CD4+ T-cell repertoire directed against an influenza peptide: a step towards TCR proteomics. Immunogenetics 54: 611-620. Kim, S. K., M. Cornberg, X. Z. Wang, H. D. Chen, L. K. Selin, R. M. Welsh. 2005. Private specificities of CD8 T cell responses control patterns of heterologous immunity. J. Exp. Med. 201: 523-533. Jellison, E. R., S. K. Kim, R. M. Welsh. 2005. Cutting edge: MHC class II-restricted killing in vivo during viral infection. J. Immunol. 174: 614-618. Barchet, W., S. Oehen, P. Klenerman, D. Wodarz, G. Bocharov, A. L. Lloyd, M. A. Nowak, H. Hengartner, R. M. Zinkernagel, S. Ehl. 2000. Direct quantitation of rapid elimination of viral antigen-positive lymphocytes by antiviral CD8+ T cells in vivo. Eur. J. Immunol. 30: 1356-1363. Kaech, S. M., R. Ahmed. 2001. Memory CD8+ T cell differentiation: initial antigen encounter triggers a developmental program in naïve cells. Nat. Immunol. 2: 415-422. Williams, M. A., M. J. Bevan. 2004. Shortening the infectious period does not alter expansion of CD8 T cells but diminishes their capacity to differentiate into memory cells. J. Immunol. 173: 6694-6702. Corbin, G. A., J. T. Harty. 2004. Duration of infection and antigen display have minimal influence on the kinetics of the CD4+ T cell response to Listeria monocytogenes infection. J. Immunol. 173: 5679-5687. Lau, L. L., B. D. Jamieson, T. Somasundaram, R. Ahmed. 1994. Cytotoxic T-cell memory without antigen. Nature 369: 648-652. Wulfing, C., C. Sumen, M. D. Sjaastad, L. C. Wu, M. L. Dustin, M. M. Davis. 2002. Costimulation and endogenous MHC ligands contribute to T cell recognition. Nat. Immunol. 3: 42-47. De Boer, R. J., D. Homann, A. S. Perelson. 2003. Different dynamics of CD4+ and CD8+ T cell responses during and after acute lymphocytic choriomeningitis virus infection. J. Immunol. 171: 3928-3935. Kemp, R. A., T. J. Powell, D. W. Dwyer, R. W. Dutton. 2004. Cutting edge: regulation of CD8+ T cell effector population size. J. Immunol. 173: 2923-2927. Troy, A. E., H. Shen. 2003. Cutting edge: homeostatic proliferation of peripheral T lymphocytes is regulated by clonal competition. J. Immunol. 170: 672-676. Varga, S. M., X. Wang, R. M. Welsh, T. J. Braciale. 2001. Immunopathology in RSV infection is mediated by a discrete oligoclonal subset of antigen-specific CD4+ T cells. Immunity 15: 637-646. Chapman, T. J., M. R. Castrucci, R. C. Padrick, L. M. Bradley, D. J. Topham. 2005. Antigen-specific and non-specific CD4+ T cell recruitment and proliferation during influenza infection. Virol. 340: 296-306. Mehal, W. Z., A. E. Juedes, I. N. Crispe. 1999. Selective retention of activated CD8+ T cells by the normal liver. J. Immunol. 163: 3202-3210. Huang, L., G. Soldevila, M. Leeker, R. Flavell, I. N. Crispe. 1994. The liver eliminates T cells undergoing antigen-triggered apoptosis in vivo. Immunity 1: 741-749. Hogan, R. J., E. J. Usherwood, W. Zhong, A. A. Roberts, R. W. Dutton, A. G. Harmsen, D. L. Woodland. 2001. Activated antigen-specific CD8+ T cells persist in the lungs following recovery from respiratory virus infections. J. Immunol. 166: 1813-1822. Marshall, D. R., S. J. Turner, G. T. Belz, S. Wingo, S. Andreansky, M. Y. Sangster, J. M. Riberdy, T. Liu, M. Tan, P. C. Doherty. 2001. Measuring the diaspora for virus-specific CD8+ T cells. Proc. Natl. Acad. Sci. USA 98: 6313-6318. Thatte, J., V. Dabak, M. B. Williams, T. J. Braciale, K. Ley. 2003. LFA-1 is required for retention of effector CD8 T cells in mouse lungs. Blood 101: 4916-4922. Masopust, D., V. Vezys, E. J. Usherwood, L. S. Cauley, S. Olson, A. L. Marzo, R. L. Ward, D. L. Woodland, L. Lefrancois. 2004. Activated primary and memory CD8 T cells migrate to nonlymphoid tissues regardless of site of activation or tissue of origin. J. Immunol. 172: 4875-4882. Sydora, B. C., B. D. Jamieson, R. Ahmed, M. Kronenberg. 1996. Intestinal intraepithelial lymphocytes respond to systemic lymphocytic choriomeningitis virus infection. Cell Immunol. 167: 161-169. Marzo, A. L., V. Vezys, K. Williams, D. F. Tough, L. Lefrancois. 2002. Tissue-level regulation of Th1 and Th2 primary and memory CD4 T cells in response to Listeria infection. J. Immunol. 168: 4504-4510. Bettelli, E., B. Sullivan, S. J. Szabo, R. A. Sobel, L. H. Glimcher, V. K. Kuchroo. 2004. Loss of T-bet, but not STAT1, prevents the development of experimental autoimmune encephalomyelitis. J. Exp. Med. 200: 79-87. Li, Q. J., A. R. Dinner, S. Qi, D. J. Irvine, J. B. Huppa, M. M. Davis, A. K. Chakraborty. 2004. CD4 enhances T cell sensitivity to antigen by coordinating Lck accumulation at the immunological synapse. Nat. Immunol. 5: 791-799. Homann, D., L. Teyton, M. B. A. Oldstone. 2001. Differential regulation of antiviral T-cell immunity results in stable CD8+ but declining CD4+ T-cell memory. Nat. Med. 7: 913-919.